At Stone Ridge Apartments, we can accommodate everyone from busy professionals to families, and from university students to retirees. 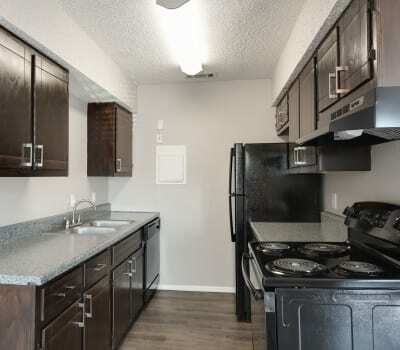 Our park-inspired community offers affordable one and two bedroom Mesquite, Texas, apartments for rent in Dallas County. Housed in stately brick buildings nestled on professionally manicured lawns, your new apartment offers a spacious floor plan, contemporary interiors, and modern design lines. Maintain your ideal environment with the aid of the refreshing air conditioning and ceiling fans in your new apartment. You can also stay warm when the temperature drops thanks select homes with cozy fireplaces. To complement the impressive layout, we’ve loaded your new living space at Stone Ridge Apartments with desirable features to simplify your life. Your spacious and modern apartment is finished with a private balcony or patio, where you can utilize your green thumb or put your feet up at the end of a long day. Experience sophistication and charm in your new living space at Stone Ridge Apartments. Give our professional leasing team a call to set up your tour of our Mesquite, Texas, apartments for rent near Walmart Supercenter.